It also said that US “exports are expected to grow 8 percent as production expansion and declining US beef prices spur demand. Lower Australian supplies will enable the United States to regain some market share in Asian Markets, However, exports will remain below the 5-year average as the strong dollar continues to hamper shipments, especially to Canada and Mexico.” That is sort of good news. However, if the decline in price is greater than the 8 percent that beef and veal exports are expected to grow, we could be selling more and still see total revenue fall. To put the value of US bovine exports into context, we decided to go to the Census Bureau’s USA Trade Online website (http://tinyurl.com/jsltwao) (USATO) and check out the data on the value of US exports since 1992. Figure 1 shows that the value of US exports fell by 12.6 percent between 2014 and 2015, while L&P shows that the volume of exports only fell 11.9 percent. Even if beef prices in 2016 remains the same as they were in 2015, the value of exports will remain below the 2014 peak. In 2015 the value of US bovine exports was $6.3 billion. 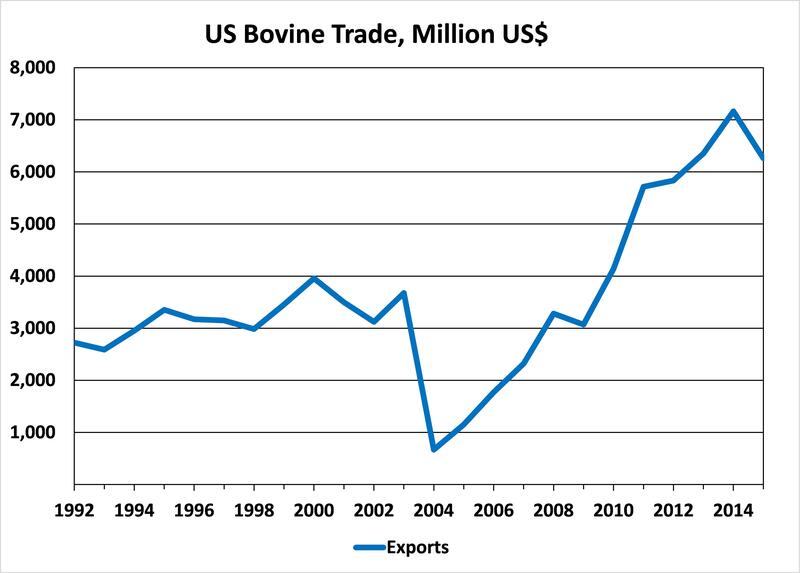 The sharp drop in the value of bovine exports in 2004 was the result of the finding of a single BSE-infected cow in the US. 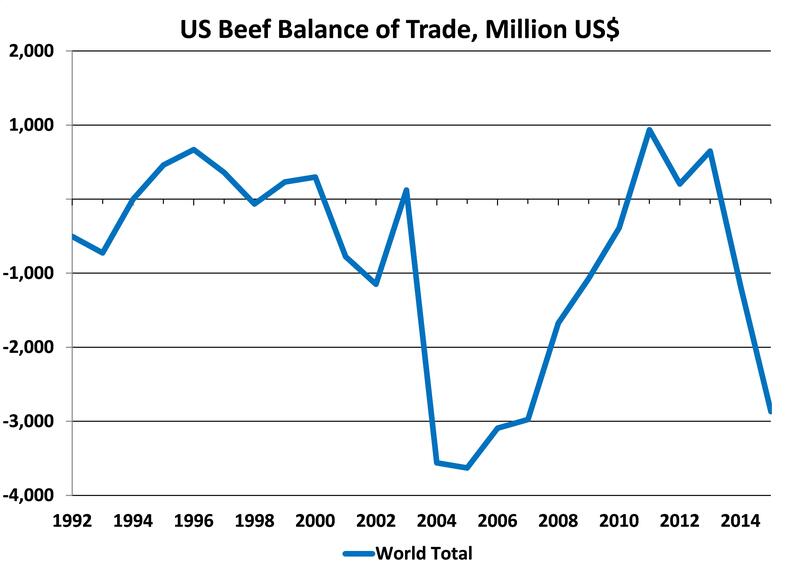 The value of US beef exports did not fully recover until 2010. Figure 1. Value of US exports of bovine products, 1992-2015. Source: USA Trade Online. Because, in our minds, trade includes both exports and imports, we went looking for the information on bovine imports. A table on page 4 of the document showed US exports, but data on US imports were nowhere to be found. The table did include a piece of information that is of vital value to US cattle producers, the “US market share (%) of exports among major traders” is projected to fall by 4 percent between 2011 and the 2016 forecast. That certainly is not the kind of information that US cattle producers want to hear. Not finding information on the volume of US beef and veal imports in the April 2016 L&P, we went to the USDA PS&D (Production, Supply, and Distribution) (http://tinyurl.com/jua9alw) website to find the numbers. In 2015 the US imported 1.5 million tonnes CWE (carcass weight equivalent) of beef and veal while we exported only 1.0 million tonnes CWE. In PS&D the USDA is projecting that the 2015 0.5 million tonne trade deficit will be reduced to 0.2 million tonnes, though they don’t say so in L&P. The PS&D numbers also contain some troubling numbers for US cattle producers. While between 1975 and 2015, the total US domestic consumption of beef and veal has declined by 8 percent, imports of beef and veal have increased by 89 percent. As a result, in 2015, beef imports were 13.6 percent of domestic consumption; they were only 6.7 percent in 1975. Looking at Census Bureau’s USATO we see that in 2015, the US imported $9.1 billion worth of bovine products, an increase of $0.8 billion from 2014 (Fig. 2). Despite the increased availability of beef that could not be exported following the discovery of BSE in the US herd in late December 2003, the value of US beef imports during that period continued to increase, falling only in response to the 2009 Great Recession. Figure 2. Value of US imports of bovine products, 1992-2015. Source: USA Trade Online. Subtracting imports from exports, it is easy to see that in most years we have a negative balance of trade in all bovine products (Figure 3). The US has had a positive balance of trade in bovine products in only 9 of the last 24 years. Over the 24 year period, the cumulative US balance of trade has been -$19.7 billion. Figure 3. 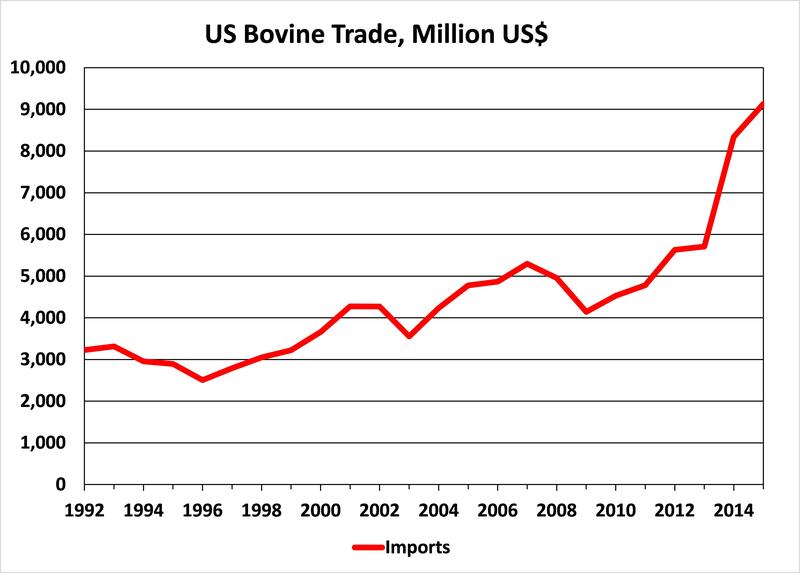 US balance of trade in bovine products, 1992-2015. Source: USA Trade Online. We understand that the USDA may want to put a positive spin on an otherwise difficult picture for US cattle producers, but we believe that in doing so the department does farmers and ranchers a disservice with analysis like that found in the April 2016 L&M. It is particularly problematic when we hear people following the lead of the USDA in promoting the Trans Pacific Partnership trade agreement by predicting an increase beef exports but not discussing its impact on US imports. When government publications talk about trade, as referenced in the title of L&P, they should be expected to discuss both sides of the trade equation, even when the numbers may not be to the liking of US producers. To make informed policy evaluations, policy makers and producers alike need full information.